Ramallah - The military Court in Ofer has confirmed the six months administrative detention order against hunger striking detainee Bilal Kayed. A confirmation hearing was held today (5/7/2016) at Ofer military court, without the presence of Mr. Kayed, who refused to attend the court hearing.The military prosecution claimed that Mr. Kayed’s administrative detention is based on secret information related to his activities inside the prison. The source of this secret information is an intelligence officer, who has personal issues with Mr. Kayed and who claimed that his release would pose a viable security risk. This clearly shows the arbitrary nature of administrative detention, which allows the Israeli government to hold detainees without charge or trial for an indefinite period of time. Addameer holds that the use of administrative detention as a policy practiced by the occupying state is systematic and arbitrary, and in contravention of international law. The use of administrative detention has attracted widespread condemnation from local and international organizations as a violation of fundamental human rights. This practice also severely threatens the human dignity of prisoners and detainees on hunger strike. 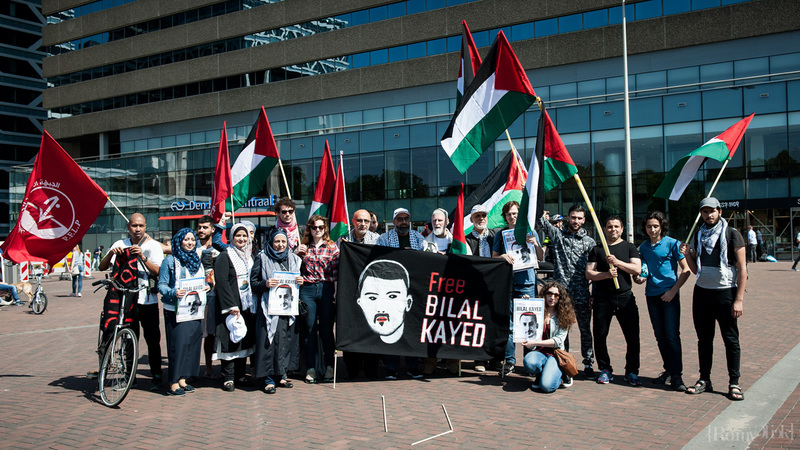 Israel authorities have transferred hunger striking administrative detainee Bilal Kayed on 3 July 2016 to solitary confinement in Ashkelon Prison. Mr. Kayed was transferred from solitary confinement in Rimon prison to Ohli Kedar prison on 28 June 2016, as he entered his 14th day of hunger strike. During his time in Ohli Kedar, he was subjected to violent raids of his cell, as well as body searching on a regular basis. When he was transferred from Ramon prison to Ohli Kedar, he was strip-searched. He reached Ashkelon at 6.00 PM last night and is currently held in an isolation section with very poor conditions. The cell is sized 2 X 1.5 meters, with no windows, and there is a toilet and a broken sink. Mr. Bilal Kayed was offered a deal of deportation to Jordan for 4 years under condition of no political involvement. However, Mr. Kayed refused the deal, which was offered to him by the military commander with recommendations from the intelligence. He was threatened to be kept under administrative detention for an additional four years for refusing the deal. Mr. Kayed reported to Addameer's attorney Farah Bayadsi that he has refused to undergo any medical examinations, vitamins and salt supplements. He is currently only consuming water. He feels tiredness, dizziness, weakness, and inability to fall asleep. His weight has fallen significantly since his hunger strike. Therefore, Addameer calls on all international organizations, including the United Nations, the International Committee of the Red Cross, the European Union, and all High Contracting Parties to the Fourth Geneva Convention to fulfill their obligations towards protecting human rights and enforcing the implementation of international humanitarian law, especially when grave breaches are being perpetrated in times of war and occupation. We call on the aforementioned actors to push the Israeli government to immediately release Mr. Kayed and pressure Israel to end the use of administrative detention as practiced by the Israeli Occupation Authorities.